Design your own incredibly soft and functional baby security blanket. Your little one will enjoy the security this "bunny soft" minky blanket will bring. Choose your colors and we'll create a custom handcrafted security blanket just for your special little bundle of joy! Just in time for your new arrival! This is the perfect security blanket for your baby. It's small enough to carry easily in the stroller or car seat, yet large enough for your baby to snuggle with. This blanket comes with our handmade satin ruffle trim. We handcraft all of our satin ruffles out of the finest quality satin. Each blanket comes folded, bowed with Tulle and wrapped in tissue. Click the fabric link below to view over 200 Minky fabric choices for your blanket. Then type your fabric choice for top, bottom, and border colors in the spaces provided. The Minky border on this blanket will be a 2" strip of coordinating Minky fabric of your choice at each end of the blanket on the "Top" side. If you would like a border choose the "yes" option. Satin ruffle trim will be a 2" satin ruffle around the outside of the blanket. Choose your colors....we'll do the rest! Make your gift more unique and special with professional personalized monogramming! Monograms on our security blankets are 1". 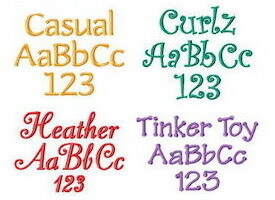 Type the name you want monogrammed in line 1. If you wish to include a birth date, type the date in line 2. The date will be centered directly under the name. Unless specified otherwise, all monogramming will appear diagonally in the lower right corner of blanket. Need it gift wrapped and mailed? We'll gladly do it for you. Choose the gift wrap option and we'll wrap your gift in lovely baby gift paper and include your personalized message handwritten in a lovely card suited for the occasion. Provide us with the recipients name and address in the "shipping address" section along with your personalized message in the "comments" section during check-out and we'll do the rest for you. Please allow 3-4 weeks production time on all custom orders. If you have a rush order, please contact us and we'll do our best to meet your needs. There will be an additional $10.00 charge per item for rush orders.